Whether you’re facing a small problem like a leaky faucet or a full-scale disaster like sewage backing up into your basement, plumbing problems require your immediate attention. 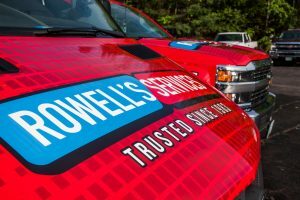 At Rowell’s Services, we offer a complete range of expert plumbing repair and replacement services in the Northfield, New Hampshire area, and we are equipped to handle projects of all sizes and scopes. You depend on your home’s plumbing system to bring you and your family fresh, clean water on demand and to remove waste and wastewater in a sanitary manner. Even seemingly minor problems warrant your immediate attention and should be dealt with promptly. The longer you wait, the more serious the problem will likely become. Most plumbing woes are related to either a leak or a clog, and these seemingly simple problems can be challenging to repair. At Rowell’s Services, we are equipped to handle these common problems and more, and we are available 24 hours a day, 7 days a week for emergency plumbing repair. Modern plumbing systems generally last for several years, but you still may face a situation where plumbing replacement is your best option. Whether your home needs to be repiped, you need to have your water heater replaced, or you are thinking about having your fixtures replaced, we can help with all of your plumbing replacement needs. When you need to have any of your plumbing system’s components replaced, it’s important to leave the job to the professionals. Improper installation can lead to a lifetime of problems and additional expenses, so it’s always best to call a professional plumber. Did you know that there is plumbing system maintenance you can perform on your home each season that will help you extend the life of the system and save on repairs? In the fall, drain and turn off any outdoor faucets. Detach your hoses and blow out your sprinkler system. Start insulating pipes that are outside or that may get cold enough to freeze during the winter. In the winter, continue your insulation project. Run each faucet each week, just to keep the water flowing (even if you don’t use it regularly). Insulate your water heater. Make sure that temps in your basement and garage don’t get low enough for pipes to freeze. In the spring, turn your systems on slowly and watch for leaks. Repair any leaks you find. Test your sprinkler system and make sure that it is working well. In the summer, watch your sewer line for any necessary repairs. These are much easier to perform when it’s warm out and the ground isn’t frozen. These tasks don’t take much time and they can save you a lot of headaches later. Schedule them in now so you don’t even have to think about fitting them in later. At Rowell’s Services, our highly trained plumbers are equipped to handle any project. Whether you’re facing a plumbing emergency or you need help with something a little less urgent, we’re always here. To schedule an appointment, please call 603-934-4145.